African design has adopted much from Moroccan decor with its rich jewel colors, mosaics, carvings and textured fabrics, but it has added its unique blend to this decorating style. bathroom color schemes: from cobalt blue (complemented with bright vermillion), rich pinks, black, red ...and all the spice colors. Dimension is added to the bathroom walls with the application of Rhinolite in free-flowing or geometric patterns one just cannot resist touching. Pigment is mixed with the plaster to create a rich, deep and varied color that cannot be replicated with a layer of paint only. Straw and wood shavings are added to the mix to create texture on the wall surface. A stunning effect is created by cladding the wall with a deep pink tissue paper. Feathers are glued on top and then it is all sealed with a clear varnish. An embellished wall niche is great to showcase objet d'art that adds to your African design or Moroccan decor theme. Concrete floors are decorated with intricate mosaic patterns to create a floorscape that becomes a feature in its own right. Or you can use standard mosaic tiles to form borders edged with copper - not in straight lines though! Create curves so reminiscent of Moroccan architecture. With African inspired designs there is no rigidity in lines or the use of shapes. Found objects can be embedded to adorn floors or mirror frames and are also a great way to create your own one-of-a-kind accent tile strip in your bathroom. There are no boundaries to the use of materials for your bathroom decor. Look for a carved wooden door with an African design or with mother-of-pearl inlays in the Moroccan decor style. Clad doors with steel and wrought iron or have it made in an interesting shape, clad with thin copper sheets. 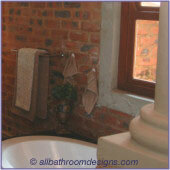 Metal sheets can be pierced or painted in decorative patterns for an unusual bathroom screen. Dress up a standard wall mounted cistern by cladding it with copper sheets and use copper for the down pipes. For a bold and attention-grabbing focal point a copper tub can be used or a steel claw-foot tub can be painted on the outside in bold and colorful patterns. African designs lend themselves to the creation of free-form designer vanities as featured on our Bathroom Vanity Units page. Alternatively, shop around for a beautifully carved Moroccan chest or dresser that can be converted into a bathroom vanity. Design Note: If you are inspired by these African designs, but you're not totally sold on a vibrant color scheme or feel that your space cannot handle it, consider this: The same ideas can be executed in a limited or monochromatic palette. The details would then be in the shapes, textures and patterns, rather than the variety of colors. 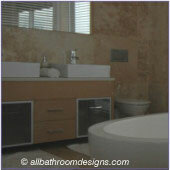 Plain wooden frames can be transformed with copper sheets or silver leaf for bathroom mirrors. 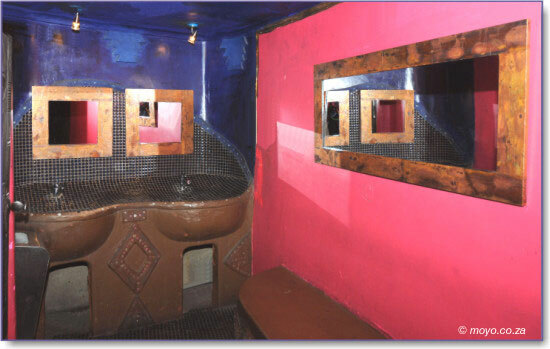 Ashley Heron, designer of the bathrooms featured on this page, kindly shared her ideas and thoughts behind the various design elements used in the bathrooms of the Moyo Group of Restaurants. Visit their website at www.moyo.co.za for their address and contact details. Better still, pop into your nearest Moyo for a great meal, ambience and African decor. An African design style such as this is not for the faint-hearted or for those who want to play it safe, but oh boy, it certainly is a show stopper. 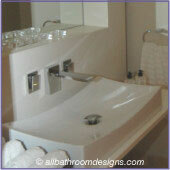 This bathroom will give you a sense of indulgence and a touch of the exotic. It is important though to select a few choice elements rather than combining all of them, which may be overwhelming in a small space. Example: A detailed colorful wall is anchored by an untreated floor, or elaborate fixtures are offset against a relatively unadorned wall.